Guest post from Dr. Koh Tse Hsien on “Clinical microbiology and Social Media” – microBEnet: the microbiology of the Built Environment network. This is a guest post from Dr. Koh Tse Hsien who maintains the blog Microcosm and also is in the Pathology Department at Singapore General Hospital. 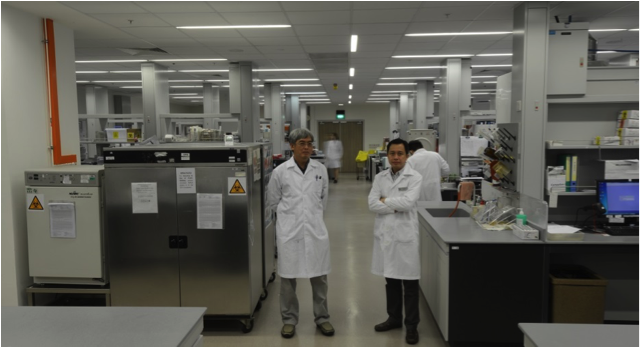 We are a diagnostic laboratory that provides bacteriology services to a busy 1600-bedded tertiary care hospital in Singapore (http://www.sgh.com.sg). We receive about 360,000 specimens a year. Towards the end of 2014, inspired by other microbiology blogs on the web (like microBEnet), we decided to develop a strategy to explore the possibilities of social media. The initial purpose for setting up a blog was to showcase some of the work that goes on in a diagnostic laboratory. Since the lab is off limits to most of our hospital colleagues, the amount of thought and effort that goes into generating a microbiology result is usually unappreciated (e.g. http://10minus6cosm.tumblr.com/post/115836238276/mud-in-your-eye-microsporidia-and-sport). We also feel that some of the micro-organisms we encounter are pretty cool and would like to share them with a wider audience (e.g. http://10minus6cosm.tumblr.com/post/130325281481/pediculus-humanus-capitis). So the blog offers a “window into the laboratory, (and) a glimpse of a world in miniature”. The advantage of the blog over a corporate website is that it can be more dynamic and we have control over the content. For example, last year Singapore experienced a large outbreak of serious Group B Streptoccus infection that was related to raw fish consumption. This is probably the first time something like this has been described in the world. While the ‘proper’ scientific manuscripts are still being written up, we have already documented ‘the human interest story behind the paper’ on the blog (http://10minus6cosm.tumblr.com/post/132590510556/serious-group-b-streptococcal-infection-in-adults). Even after the scientific manuscript is published, the blog post will remain more accessible and readable for the general public. Increasing public awareness of microbiology can only be a good thing. We also have a Facebook page (https://www.facebook.com/DiagnosticBacteriology). This is where we post lab/hospital activities, but can also be useful for disseminating news like new guidelines or interesting publications. In our experience, the Facebook page is also good for lab esprit de corps and presenting a ‘lab face’ to our customers. Lastly, we also have a Twitter account (https://twitter.com/10minus6cosm). We find Twitter very useful for keeping up to date with developments in bioinformatics, infection control, and outbreaks like Ebola, MERS-COV and Zika. You can get a sense of what we think is interesting, or is an important trend, based on what we retweet. Finally, all three social media platforms are integrated. Whatever we blog gets reflected on Facebook, which also automatically posts to our Twitter feed. Dr Koh Tse Hsien (left) maintains the blog and twitter account. Dr James Sim (right) updates the Facebook page.